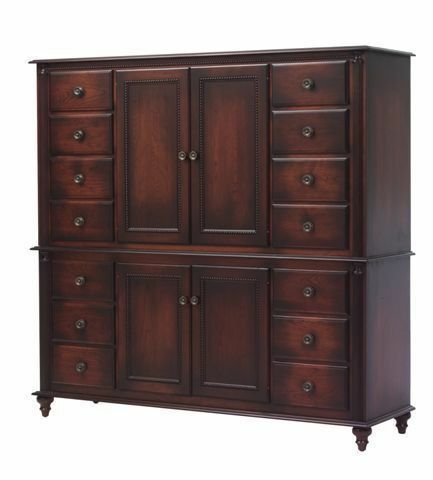 The Amish Fur Elise Two-Piece Chifforobe Entertainment Center features an elegant, modern design that still maintains a beautiful, warm ambiance in your bedroom suite. Crafted from the finest hardwoods and finished to perfection, this heirloom quality storage piece is sure to give you the perfect heirloom to hand down for generations! The Fur Elise Entertainment Center comes fully equipped with full extension side mount slides on all drawers and two large door cabinets that have an array of functions. Replace the removable shelves in the top part of the unit and add the pocket doors, TV swivel, cable box shelf and knockout back panel and you'll have the perfect place to watch your favorite shows, with the luxury of hiding your television when not in use. The Fur Elise Entertainment Center is sophisticated and stately. With adjustable shelves and TV options, this Entertainment Center is a versatile storage piece that is sure to have room for your clothes, linens and TV, in one location! With an array of hardwood and finish options, customize your chifforobe to fit your unique decor today! Call 866-272-6773 to speak with one of our Amish Furniture Specialists with any questions or to receive a custom quote. They will be happy to help you out.